The Heritage Lottery Fund awarded Ipswich Borough Council a project planning grant to pay for the investigations needed before restoration work began at Holywells Park. Wessex Archaeology excavated a number of trial trenches to record old surfaces and structures hidden under the ground. These remains tell us more about the history of the park, and the arcaheological results were fed back into the renovation plans. The park has a long history, we have evidence of people living in the area for thousands of years. Flint tools from the Stone Age have been found at Holywells, while Bronze Age axes and Roman coins have been discovered nearby. The earliest written records tell us that the area was part of the manor of Wyks Bishop, held by the Bishops of Norwich from the 13th century, but we do not if an estate house existed on the site at that time. During the reign of Henry VIII the manor was surrendered to the crown, and shortly afterwards granted to Sir John Jermy. 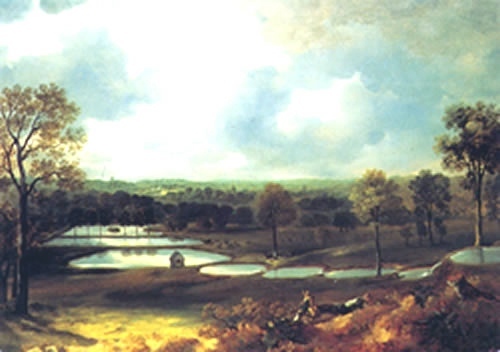 There followed a succession of lords of the manor before the title was acquired by John Cobbold in 1812. 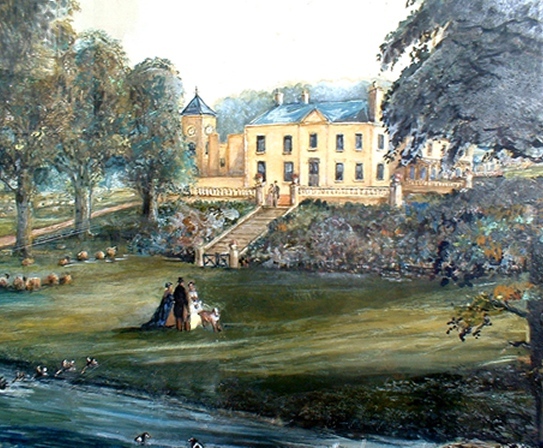 The painting right shows park and house in 1867. It is the remarkable natural springs that give Holywells its character and have shaped its history. During the eighteenth century a succession of brewers worked here and used the waters to make beer. 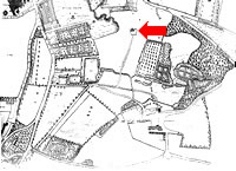 The Cobbold family owned land at Holy Wells from 1689. They had begun their brewery in Harwich but had problems with the water there. For many years they used ships, transporting water from Holywells to Harwich, the same ships returned to Ipswich transporting the beer. Holywells House was built in the nineteenth century on the site of an old farmhouse. Its gardens, originally reflecting the Victorian taste, were redesigned in the twentieth century in accordance with the ideas of gardeners like Gertrude Jekyll. Now the house and gardens have gone. Only the stable block remains above ground, and the history of the park’s landscape is hidden below our feet. The two test pits dug on the terrace told us that the area has been built-up rather than cut into to create the terrace that is visible today. The construction was mainly of sand and what appears to be eighteenth century brick rubble. The rubble is possibly from the farm that pre-dated the manor house on the site, which is mentioned in historical sources. The raised terrace was then covered by a chalk surface or path 1-2 cm deep. Two trenches were dug in this area, one to the east and one to the west. 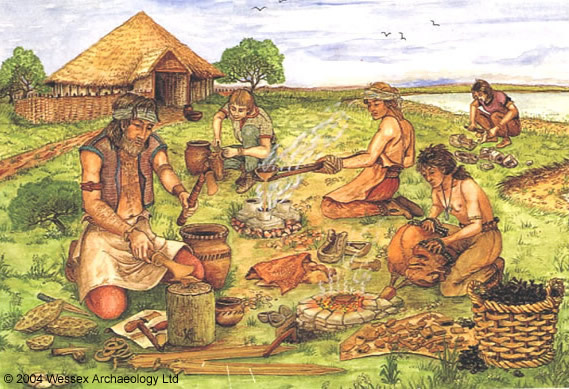 In the eastern trench it was hoped we would find evidence of the medieval field boundary seen on early mapping, but only a mixture of sand, clay and rubble was recorded. The western trench however did show positive evidence for the presence of a channel or water course. A further two trenches were opened in this area. 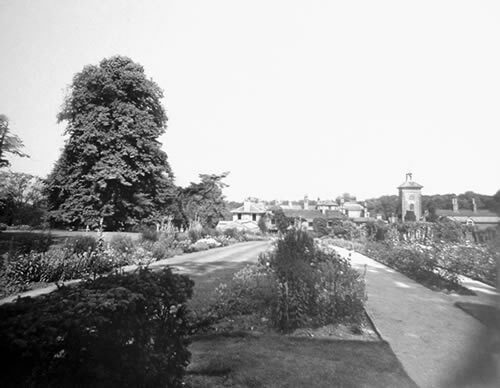 The first contained the remains of one of the garden paths, pictured in an early photograph (right). The brick rubble beneath the path’s surface covered a land drain. More drainage was found in the other trench, along with the foundations of a wall. The information recorded in the these trenches has been used to work out the complex sequence of events here, from the gardens long history. The results from this work was fed back into the renovation plans. A trench was placed across the predicted location of the 12/13th century moat ditch but due to its depth, and flooding from the high water table, hand excavation of the ditch was not possible. However an auger survey was carried out (using a kind of drill with a spiral tip which brings soil to the surface for analysis). This allowed us to establish the depth and shape of the original ditch, and showed how it had later been filled in with organic material and sandy clays. Further augering work was undertaken in the moat ditch to the north. The results showed the depth of the moat ditch (3.5m) and that the embankment at this point was made up of sand quarried from elsewhere on site. This embankment was probably as part of the nineteenth century alterations to the grounds, which created a raised walkway across the moat. A geophysical survey has also been carried out in this area, within the moat. The survey was hampered by the magnetic effects of the nearby play equipment but, where a clear survey was possible, it gave no evidence of any buildings. So the question of whether the moated site was ever occupied remains to be answered. A trench to identify the ground plan of a cottage shown on the early nineteenth century maps found only post-medieval rubble, with no structural evidence remaining. It is possible that the cottage had been totally demolished with even the shallow foundations losts, or perhaps the location shown on the old maps is inaccurate and the cottage lies elsewhere. The upper part of a water course was found in our trenches. It had a clay lining and had filled up with natural sands. Shortly after excavation and recording the trench became totally immersed in water – the channel is still doing it’s job! Two open days were held during the Holywells excavation, these were well attended with over 100 visitors coming to learn more about the investigations in the park. 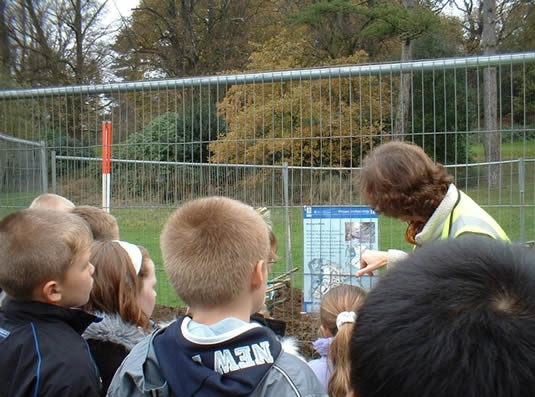 Children from local schools and members of the Friends of Holywells, the Ipswich Society, Ipswich Borough Council and the Park Rangers took part in guided tours around the excavation over the two days. Phil Harding, the popular Time Team celebrity, who works for Wessex Archaeology, was one of the archaeologists working in the park. Visitors were delighted to have the chance to meet him and ask him questions.